As spring approaches in Atlanta, the pansies are starting to fade and some old friends like hyacinths and daffodils are already emerging here. I wanted to get a few more pansy paintings in while they last. They are fun to paint. Each flower seems to have it's own personality. 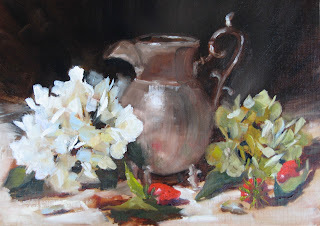 If you would like to learn how to paint flowers in a simple and fresh way, you may be interested in my "Painting Flowers Alla Prima in Oil" workshop at the Art School in Sandy Springs in Atlanta, the weekend of March 17-18. Please contact me at patfiorello@aol.com for more details. Back doing a few more paintings in my "Enchanting Italy" series which may be included in an upcoming show at Frameworks Gallery in Marietta, GA, opening March 29. This one is of a small town we visited for a "gelato break" during last year's painting workshop in Tuscany. Urns typically have symmetrical and often complex shapes, so they pose a real drawing challenge compared to more natural elements like flowers or trees, where you can be off a bit and not have it be so noticeable or distracting. I decided one of my goals for this year is to build my drawing skills further, so that tackling these types subjects would become easier. Honestly I love to paint but don't have the same passion for drawing. 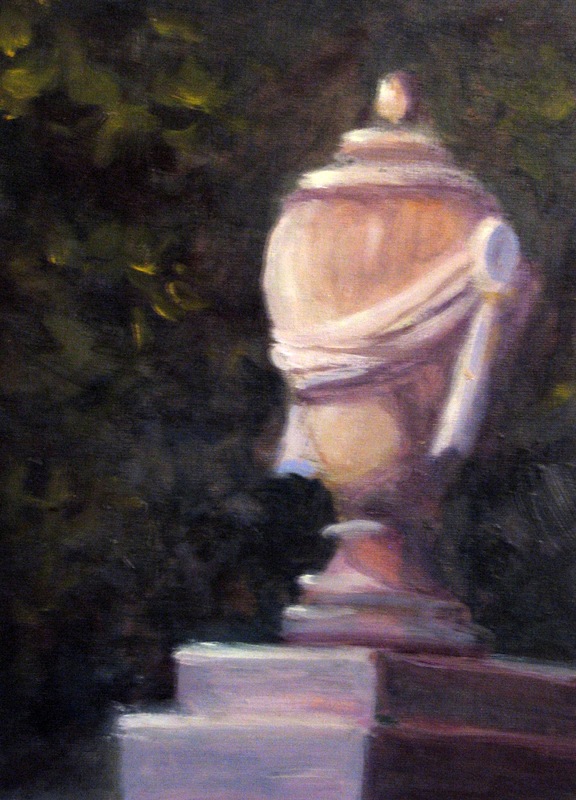 I have always had the attitude that drawing was a "necessary evil" in order to paint. I just want to get going with the brush and paint, not slow down and draw. But if I am honest with myself, probably the one area that would elevate my art the most would be building my drawing skills and confidence, so I'm biting the bullet and hoping I will learn to love it as much as painting. I am currently reading "Lessons in Classical Drawing" by Juliette Aristedes. I just stumbled upon in on Amazon a few weeks back. I think it is a relatively new book, but I am really enjoying it and finding it very instructive. I've committed to myself to read one chapter and do the corresponding exercise each week. I'm about halfway thru the book, but wanted to share it now as I would highly recommend it just on what' I've seen so far. It also comes with a DVD tucked in the back of the book jacket. Is very well done, upbeat and inspiring and shows Juliette demonstrating her suggested approach- which really helps a lot. It's one thing to read about drawing but another to actually see someone do it. There are some tried and true drawing books out there like "Drawing on the Right Side of the Brain" by Betty Edwards and several others, but I have a feeling this book will quickly become a classic in it's own right. Even though I've been drawing and painting for nearly 2 decades, there are things I picked up that are helping me already. Great job Juliette! Thanks for sharing and inspiring your fellow artists and students! I just completed a very special commission project. A client of mine wanted to surprise his wife for Valentine's Day with a painting of a garden in Canada near where they got married and where they recently made a return visit for their 10th anniversary. He supplied some photo's from the recent trip and had a wonderful image of a beautiful area. The challenge was transforming the vertical reference photo into the horizontal format he wanted for the room he had in mind. I ended up taking some artistic license and enlarging , exaggerating things as well as lifting a portion of a building and trees from other photos to create a horizontal design. I love to do commissions, especially when I know the painting will be a very thoughtful and meaningful gift for someone special. Here was the original reference photo I had to work with. Here's a painting I did a few weeks ago. The red and yellow roses seemed to come easily and naturally, but I had the hardest time with the pink one which was at an unusual angle. I scraped it down several times till I got something that worked. Sometimes you get stuck on one part of a painting. It's tempting to leave it as is, but I've learned if it bugs you today, it will bother you every time you look at it, so might as well address it now ( or maybe tomorrow when you can come back with "fresh eyes"). One of my favorite painting instructors, Robert Johnson always says a painting will be brought down to the level of it's weakest element. Every so often I hear his voice in my head and then I know it's time to scrape it down and give it another shot. A peaceful memory of my trip to Lake Garda. This is the view from San Tomaso, the place where I taught a workshop up on a hill in the lake town of Gargnano in Italy. Had a beautiful view out to the lake. You could sit there all day and be mesmerized by the beauty and serenity of it all. I'm taking a workshop here in Atlanta this week with Leslie Saeta and Dreama Tolle Perry of AHA fame ( for those of you not familiar with this dynamic duo of artists- they are the hosts of the "Artist Helping Artists" radio show each week on blogtalk radio). They are both in love with luscious color as much as I am, so it's been fun having totally free reign with lots of bold color. 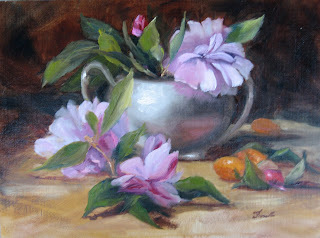 Below is a photo of Dreama with her beautiful and vibrant oil painting demonstration from Monday. I tried to apply the approach I learned on a similar subject I had from one of my trips to Tuscany above. in the painting Tuscan Garden. 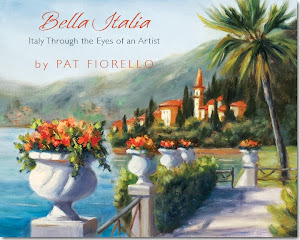 This was inspired by a photo I took in Volpaia which is in the Chianti Region. Had to simplify a lot out, but wanted to capture the joy and pride the people in that small town have in their plants and flowers in abundant container gardens right out on the sidewalk in front of their homes. 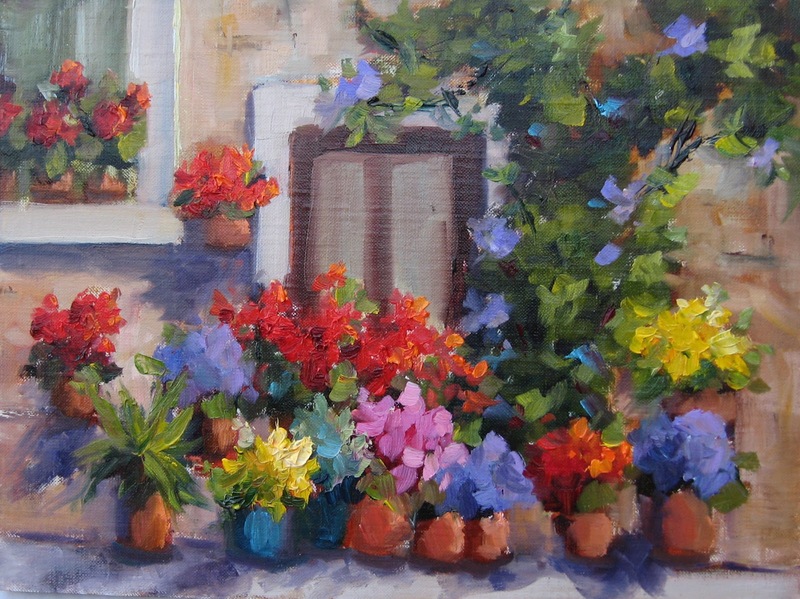 Hydrangeas- one of my absolute favorite flowers to paint. Tried some white and green instead of the blue I usually do for a change. The silver pitcher was fun and a a challenge not to overdo the reflections. Added a few strawberries into the mix to have some bright color. I bought this beautiful jar at a local florist specifically because I thought it had an interesting shape and would be a nice focal point for a still life, but hadn't got around to painting it yet. Enjoyed painting this relatively simple set up from life. I simplified the calligraphy quite a bit to just suggest it, but hope I still retained the feel of the jar. I have a photo of the actual jar and set up below. I'm back working on some more florals in preparation for my upcoming exhibit in Charleston opening April 6 at the Spencer Gallery . The name of the show is "In Full Bloom" featuring lots of flowers in celebration of spring and the return of color to our gardens. These were some Camellias from a garden here in Georgia. 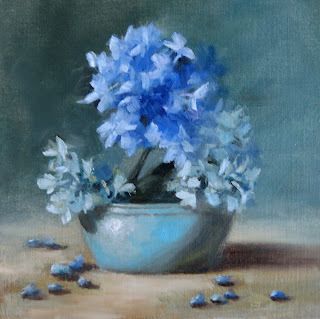 Here's one done from life last week from a grourp of blue and bluish green hydrangeas. It's a little more monochromatic palette than usual. Hydrangeas are one of the most fun flowers to paint!